The gaze however privileges sight over the other senses, feeling the heat and humidity, smelling the salt in the air, tasting the spices in the food, hearing the birds or the crash of the surf. The resort is real, the heat is real, the birds and beaches are real, but the question of authenticity comes from their interpretation and configuration, that all these things are conveniently put together. It is all manufactured. My first reflections on authenticity came many years ago visiting the Swiss Family Robertson’s Tree House at Disneyland. From a distance I was impressed by the tree; its size and structure so convenient for hosting a tree house. It wasn’t until we were in the house and I touched the tree that I discovered it was made of concrete. I was both surprised and amused. I was surprised at how real the tree appeared. A true-to-life representation formed in concrete of a real object that was a subject in a fictional storey of a shipwrecked family based on the story of Robinson Crusoe thought to be based on the life of Alexander Selkirk, a castaway for four years on Más a Tierra, renamed as Robinson Crusoe Island in 1966 (Wikipedia). Why do I care about authenticity? In my Project Statement I noted that “… tourism asks us to reflect on our understanding of authenticity …” More broadly, seeing authentic things, buildings, landscapes, peoples, cultures, are very often the objective of travel. The story above offers some sense of the challenge. Uncommon in my daily life, the drink is something that separates this from my regular place. It is a marker, this drink becomes an ingredient in the definition of this place, this region, the Caribbean. There are stay-cations, where the tourist stays at home. While I don’t intend to discount the value of these, they are not my immediate concern. I am interested at this time in leisure travel; one that involves a change in place. Put another way, change of place is a means to achieve differentiation. Differentiation stimulates interest, then engagement, a deeper observation of our surroundings. Changing our location takes us out of our routine surroundings that we move through each day often on automatic pilot without looking as we have seen everything already, a hundred time before. In a new place much is novel and in this it is engaging, elevating excitement, and adrenaline. There are mental and physical responses. Thus, the first step is the departure that carries us away physically and mentally. In the book Qualitative Research in Tourism : Ontologies, Epistemologies and Methodologies, edited by Lisa Goodson, and Jenny Phillimore, author Barbara Humberstone notes that “…tourism studies are about the relationship between the visitor, the Other (host) and the locale …” (p.120). This begs the question what makes for a good relationship? Developing Humberstone’s thought further, transactional elements of the relationship emerge: expectations or wants (by the visitor), offerings (by the host), and context or culture (provided by the locale). Modelled in more mathematical terms, a visitor’s wants are serviced by some proportion of offerings of the hosts and the context of the locale. Presumably, goodness of a relationship is measured by success in satisfying the visitor’s wants. This model offers a point of departure to develop and organize my thoughts on the workings of tourism. As a first step, I apply the model to a recent trip, beginning the process of validation and refinement. In this experiment, the trip falls into the category of leisure travel; reseting one’s context of place and routine to escape the shackles of daily life, delivering us from routine into an alternative state (the offerings in context) that enables relaxation (the wants). Or so goes my theory. Applying the model, I recognised the subjectivity of wants, their malleability, and that there was some sort of negotiation among the model’s elements. That is adjustments in the offering and context determine which wants could be served and how well. Conversely, the search for “good” wants would determine the configuration of the offering and context. This lead me to think of the relationship as less an algebraic one and one more algorithmic, by which I mean, the focus is less about the equivalence between wants and offerings + context and more of an optimization calculation (and here I have in mind Runge-Kutta Fourth Normal Form where the parameters vary, generating a landscape of wants, and it is from this landscape a choice is made, possibly determined by economics). If, as suggested above, the primary want of leisure-travel is relaxation, realising goodness, while a subjective assessment, comes down to an optimization process minimising tension and maximising harmony. A frequent first step in leisure-travel is to change context (locale) as in getting away from it all. In this test case the context was changed from a cold, wintery Canada, to a resort hotel on a small island in the Caribbean. The offerings are provided by the resort, the local businesses (tour operators, restaurants, shopping, etc.) and the character of the island. All were presumably arranged for the visitor, to reduce “hassle” and maximise enjoyment. Over the years, these arrangements have become more and more sophisticated, tuned by market demand, resulting in the design and development of destinations that optimise the parameters in such a way that the place is both attractive and economically viable. … mass tourists travel in guided groups and find pleasure in inauthentic contrived attractions, gullibly enjoying ‘pseudo-events’ and disregarding the ‘real’ world outside. As a result tourist entrepreneurs and the indigenous populations are induced to produce ever more extravagant displays for gullible observers who are thereby further removed from local people. This leads me to define the dreamscape as that type of place optimizing context and offerings towards a visitor’s wants. While such places may exist in nature, many are created and thus the refined notion of the Manufactured Dreamscape. A place that has been designed, tuned, managed and built to purpose. There are as many of these as there are dreams, and wallets. Yet we should not condemn too quickly these manufacture dreamscapes. In his article Staged authenticity: arrangements of social space in tourist settings published in American Sociological Review, 79 (1973), MacCannel, using the term ‘staged authenticity’ suggests that such places are both a means of generating value as well as protecting the lives of the host people. Climbing the stairs, we enter into the resort and leave behind our daily life, and weather, entering a space manufactured to create distance from our normal reality. In a curious way, the purpose of the dreamscape architecture is similar to the purpose of sacred architecture (to define a space that conveys the glory of God and the magnificence of Heaven on earth). Something to look forward to. Looking at Habitat today provoked for me an image that is as far away as one could imagine. Built for Expo ‘67, Habitat celebrated its 50th anniversary last year. At the time it was considered a marvel; the future of apartment or high-density living. I remember touring the building shortly after it opened. 20 years later, a friend of mine recalled spending the summer of 1967 billeted at Habitat. It was uncanny to ponder that our paths may have crossed some 20 years earlier. Looking at Habitat across the harbour, just last week, it wasn’t these memories that came back, but rather those images of destroyed cities in Syria. Habitat looked like ruins of some bombed city. It was eery. It’s been a while since I’ve returned to Montreal to visit, and approaching 40 years since I left. What caught my attention was the name changes, often toward prominent political figures of the last 50 years. Naming a place after a person is a form of memorialization of that individual; a trigger for remembrance. Yet for many, the names no longer trigger a memory, rather, they act as a reference that can be searched with Google. The intersection that was formerly Dorchester and University is now René Lévesque and Robert Bourassa. The humour of this connection caught my attention: the intersection of two premiers of Québec, two ideologies, the separatist and nationalist, two political parties, the Parti Québécois, and the Liberal Party. A juncture marked by two referenda that nearly ended in the dissolution of Canada. Lévesque was a passionate man who believed in the separation of Québec from Canada; Bourassa was clinical, unemotional, an economist. I don’t think there could have been two so very different personalities. I met Lévesque once, briefly in 1974, two years prior to him being elected as premiere of Québec. He was honest and straight forward, he was down to earth, not an elitist. He was a chain-smoker. Today he might be called a populist, but he was smart and quite capable of challenging the political intellectuals of the time. I would have voted for him, had he not had separation as part of his agenda, because I believed he would do what he promised, and if not, it was not for lack of trying. Looking out the window of our room I saw below the statue of Samuel de Champlain, the “Father of New France” and founder of Québec City in 1608. To the left the Canadian flag flew at half-mast to recognise the death of Bernard Landry, a former Premier of the Province, and a separatist. The image struck me as the concurrence of three texts: a beginning and an end, in a place willing to remember both. I returned home last week, July 15th, after just over 8 weeks on our latest travel assignment. Since returning I've been able to prepare a slideshow (just over 3.5 minutes) of some shots from Newfoundland. Yesterday had one objective. Have oysters in Malpeque. The village is famous for these little molluscs. They come in two sizes: small and large and are served in two portions: a half dozen and 1 dozen. I had 2 dozen. They were good. Yesterday was a gentle day, we drove north from Charlottetown to Prince Edward Island National Park, and then along the Gulf Shore Parkway to Green Gables and then south to Miscouche to spend the night. Our goal for the coastal drive was to find the red sandstone cliffs facing the sea we recalled from our visit of 20 years ago. While we found something similar, they lacked the magnificence our memories pictured. Whether that was through physical erosion or mental elaboration I don't know. But certainly now what we saw is mostly fenced off; 20 years ago it was possible to climb the rocks. 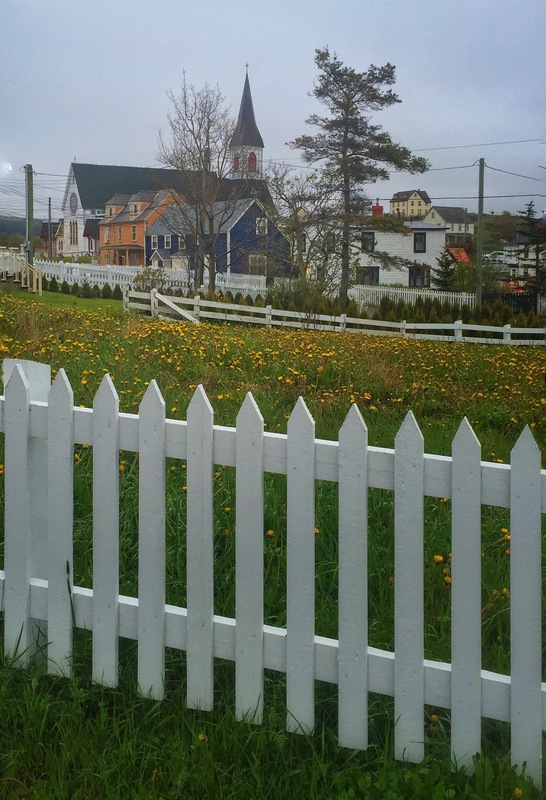 After the coastal drive we visited Green Gables, the home of the fictional Anne Shirley. Although it was an attraction those many years before, now there is a visitor's centre and a whole host of visitors trappings. As I have not read the books, the scene offered little. For dinner we picked up some groceries and ate on the shaded deck of the B&B in Miscouche we had booked; a nice light meal in a quiet and comfortable setting. Yesterday we drove from Charlottetown to East Point, and then along the North Shore of the Island to Greenwich and the back to Charlottetown. We climbed to the top of the lighthouse at East Point which gave us a view of the Point and beaches. On the North Shore we stopped into the fishing village of North Lake; a busy harbour with boats coming and going every minute. We ended the day's tour at Prince Edward Island National Park and a walk along the boardwalk out to the beach. Miscouche, Prince Edward Island is our next stop. We left Chéticamp Nova Scotia fairly early and drove about 6 hours to Charlottetown PEI. We decided to cross over to PEI on the Confederation Bridge. While there is a ferry service to the island, that was closer, co-ordinating with the schedule proved more cumbersome than necessary so we drove the extra distance. The toll for the bridge is $46. return; payment is on return, not on entry. It strikes me as an encouragement to stay on the island. The Inn where we are staying in Charlottetown is located in the downtown area just up from the shore. After checking in we visited a nearby floating restaurant for a light lunch of a half pound of mussels and a beer for $9. We then walked over to Queen Street up to the Confederation Building which unfortunately is closed for renovations. We returned along Queen and had dinner. But here we changed our menu from fish to meat. Linda and I shared a Chateaubriand. A nice change. 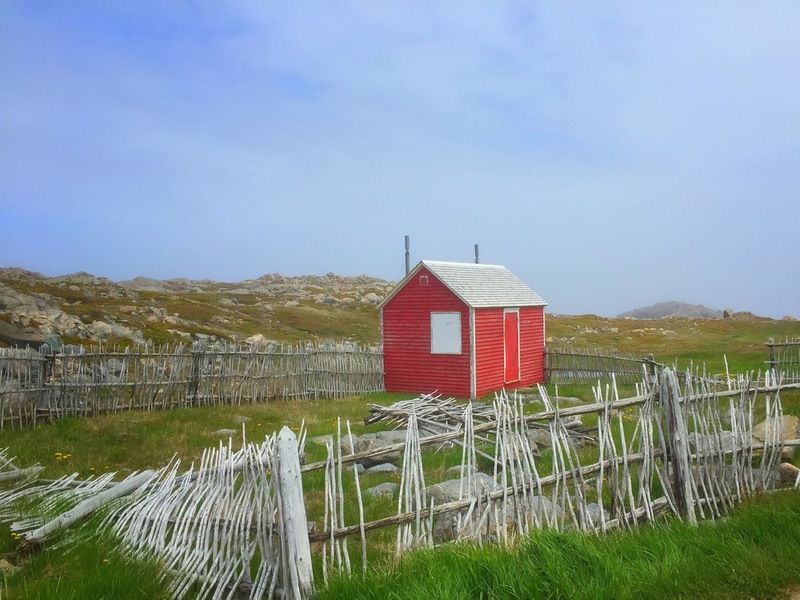 As a result of the delayed ferry we had compress our visit to Louisbourg and our drive along the Cabot Trail. As it turned out, weather complemented these decisions. We left the Inn where we were staying in Lousibourg and arrived just before the gates opened. At this time of year visitors are bussed to the site; we were on the first bus. The village and fortress were thus quite empty. While there was fog when we arrived it was not too dense. This changed over the morning until by noon visibility was severely reduced and we decided to leave. Louisbourg was a major centre in it's day. One guide called it the Fort McMurray of it's day. It was a resource-rich area (cod fishing) where people could come and make high salaries. An interesting perspective. Occupation of the area pre-dates the building of the fortress and the wall around the village. That came with economic activity and importance. The village contains business, residences and small farms organized along wide streets. One farm had turkeys and a proud male walking behind the house. When I played various turkey calls from my Bird App, the male responded with loud calls of his own and a full display of his tail feathers. The Fort was Built in 1720 and then destroyed by the British in 1760, or just about 40 years later. It was rebuilt starting in the 1970's so arguably it will have a longer life as a museum than an active fortress and village. 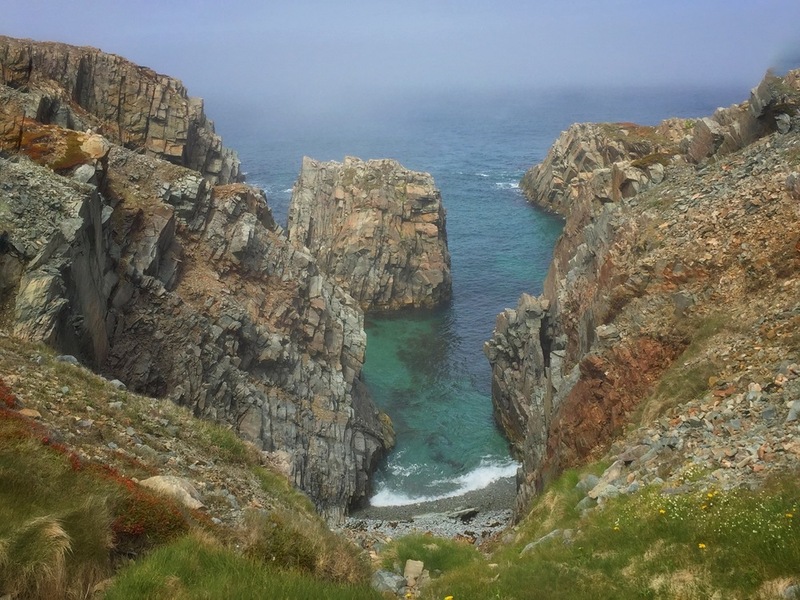 As we drove in-land from Louisbourg towards the Cabot Trail, the fog thinned. By the time we reached the trail the fog had lifted to expose a beautiful, warm day. We drove the trail counter-clockwise as recommended by many. This direction provides easier access to the lookouts and a slightly less encumbered view of the coastline. We stopped at several lookouts, but with our shortened schedule we took no hikes. The Park at the top of Cape Breton is quite large, and the trail just skirts the perimeter. Hikes into the interior would do the Park more justice. We ended the day in Chéticamp, just outside the Park, where we spent the night. Our next stop is Prince Edward Island. Our last stop in Newfoundland was the terminal at Argentia for the ferry to Syndey Nova Scotia. Unfortunately the departure was delayed nearly 11 hours. This delay will impact our visit to Louisbourg and the Cabot Trail. We had dinner on board while we waited for departure; it turned out to be excellent. We all had the halibut. Halibut is a difficult fish to cook without it becoming dry and unsavory. However this chef was able to avoid that problem and deliver a juicy filet. At 4:00 AM the ferry departed Argentia, and arrived at Sydney at 7:00 PM local time or after 15 1/2 hours. The first third of the ferry's course seemed to be close enough to shore that we continued to receive a cell signal. This was a nice surprise. However, it was only until we reached Sydney Harbour that the fog lifted which was too bad because I had hoped to see something of the landscape. While we were last to board, we were among the first to disembark which enabled us to get to our hotel earlier than I had anticipated, which was a pleasant outcome. 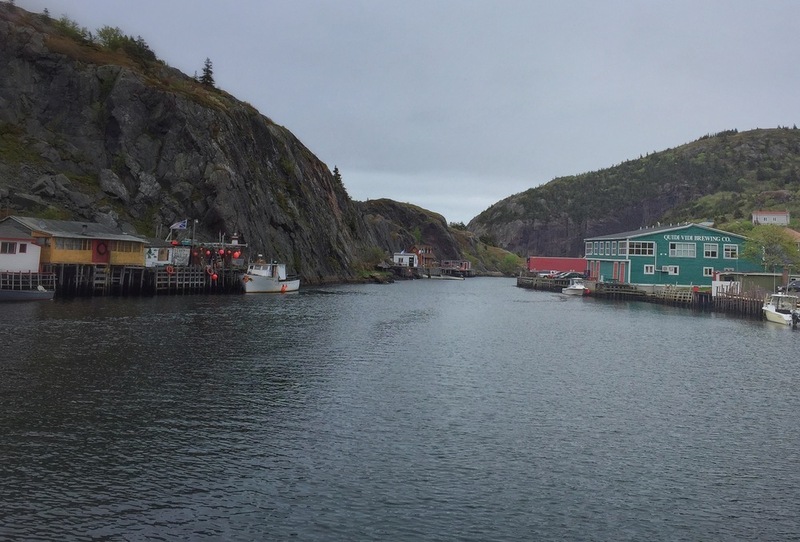 Yesterday's main event was a boat cruise out to Gull Island, off Bay Bulls, just west of St. John's. Prior to the cruise we returned to Cape Spear as it was along the way. We ended the day with a walk in the area we are staying in St. John's. It was a sunny and warm day, the temperature in St. John's reached 20 or so. Thus it was a perfect day for a boat ride. The goal was (again) to see some puffins, which we did, but again even the reach of my 400mm was insufficient. However, on the way to the island we came across to some Fin Whales; no breaches, just the fin coming out of the water, but enough to say we had seen them. As the cruise didn't start until 10:30, and the weather was good, we decided to return to Cape Spear and climb up to the lighthouse. Yesterday's blistering cold wind made that trek very uncomfortable. Today we will drive to Argentia for the 5 PM Ferry back to Sydney Nova Scotia. The crossing takes between 16-18 hours, and thus without WiFi I may not be able to post for a day or so. 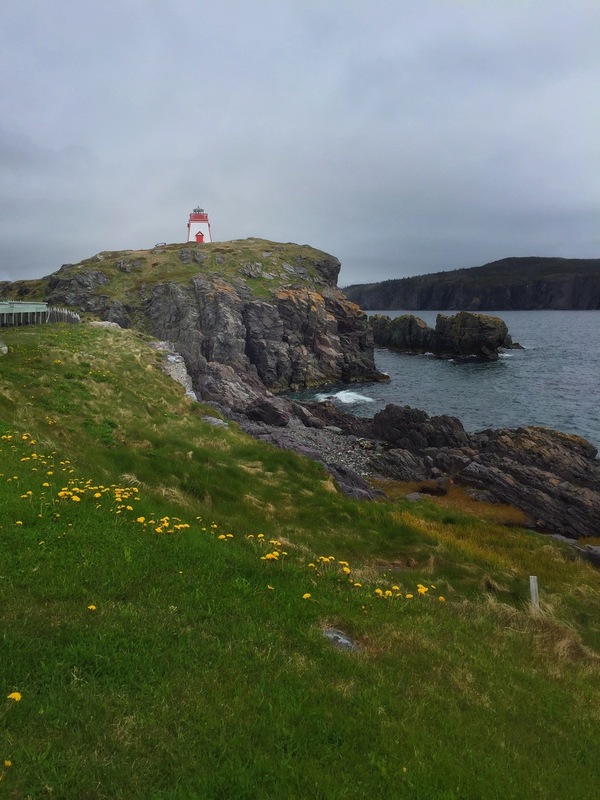 Yesterday, we drove to Cape Spear then continued west through Petty Harbour and Bay Bulls and finally returning to St. John's and a walk downtown. Cape Spear currently hosts a lighthouse, but formerly hosted a fortress guarding the entrance into St. John's Harbour. 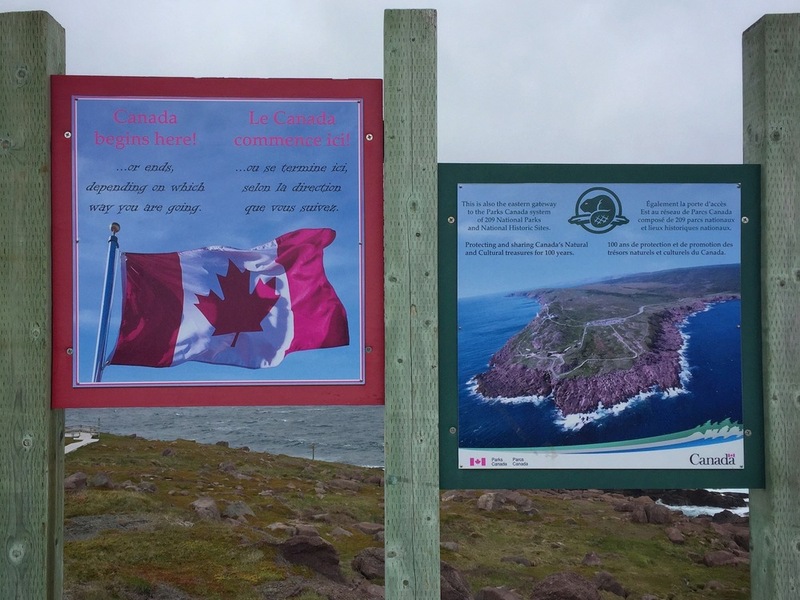 The Cape is also the eastern-most point of land on the North American Continent. At that eastern-most point the seas were rougher than we had seen since arriving; the wind was strong and cold. A flag flew near by; it must be the eastern-most flag on the Continent. In Bay Bulls we had lunch and returned to St. John's for a walk along the harbour and then back along Duckworth Street and then New Gower St. and then to our apartment. Yesterday was our first full day in St. John's. We toured around some of the major attractions (Signal Hill and Quidi Vidi Brewery), met a friend for dinner and listened to Newfoundland Folk Music. 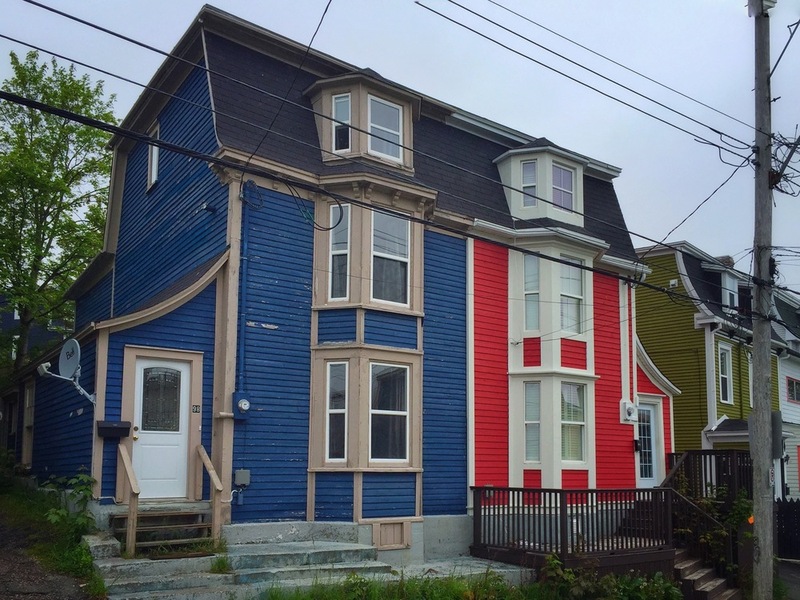 In St. John's we've rented a duplex, the main floor and basement portions. It is located within a 10 minute walk of the centre of downtown. The houses in this area are traditional St. John's architecture: colourfully pained row-houses, generally late 19th Century. While the floors are uneven (even wavy) and no room seems square, for a 4-day visit the accommodation are quite satisfactory. These foibles provide character rather than nuisance. Like Fort Point in Trinity, Signal Hill has been a military post since the mid 18th century. Most of the buildings and fortifications are gone. The Cabot Tower is a newer addition, built in 1897. The Hill provides a great view of the city and the entrance to the harbour, as well as a number of trails. We walked the trail between the Tower and the Visitor's Centre. While we were at the top of the Hill to watch the firing of the noon-time canon, this time of year it is shot only if the guy turns up. On this day he didn't. Apparently, in July the ceremony is completed on a regular basis. Next we drove over to Quidi Vidi Brewery, for a tasting. This Newfoundland Brewery brews 7 different beers and we were able to taste each one. On our tour through Newfoundland, beers from this brewery have been the most widely available, especially their Iceberg beer (lager) and 1892 (ale). We met a friend in O'Reilly's Pub for dinner. 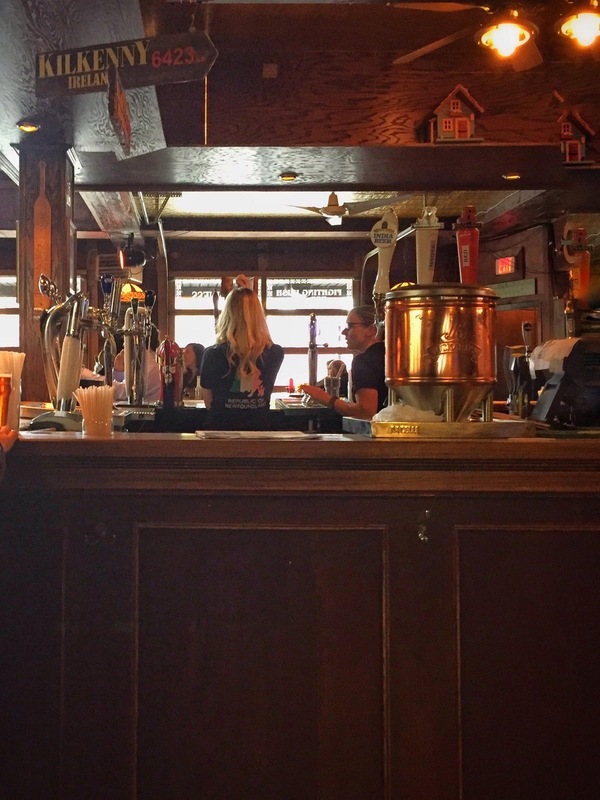 The Pub has live Newfoundland/Irish music starting at 5:00 PM. We arrived just before 5 and were able to get a front-row table. Linda had pan-fried cod with scrunchions, Dad had rabbit and I had a moose stew. They also served Kilkenny on tap. 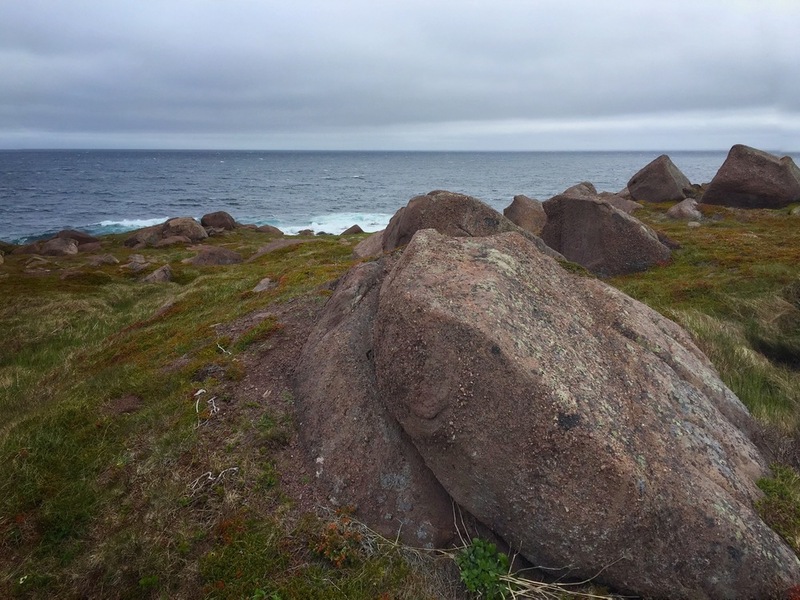 Next we will visit Cape Spear, just south west of the city. Looking out from our cottage in Trinity, across the harbour, was a lighthouse. It occupies the spot that was formerly Fort Point. The Fort was built in 1746, taken by the French in 1762 and destroyed, recovered and rebuilt in 1780 and again in 1812 and then left to decay . Now there are few signs of the fort. The first lighthouse was built in 1871; the current lighthouse which is the third iteration, was built in 2007. At the Interpretation Centre in the Fort is a very detailed map of Trinity made by the French in 1762. It shows each house, dock, and garden. It appears that Trinity in 1762 was more densely occupied than its is today; many of the lots and docks present then are now vacant. Walking through the village one notices that, like many Newfoundland villages, the lots are irregularly shaped and the houses are often randomly arranged, unlike the village we live in where lots are of regular size and dimension and the houses on any one block face the same direction, north-south or east-west. I expect what may appear as random (and less efficient use of space) is in fact the best utilization of the ground on which they sit: a rugged coastline. Our next, and last stop in Newfoundland, is St. John's. Giovanni Caboto (or Zuan Chabotto in Venetian) landed in Cape Bonavista in 1497. We got there in 2016. Well, in fact the landing site was in dispute until "...for the 500th-anniversary celebrations, the governments of Canada and the United Kingdom designated Cape Bonavista in Newfoundland as the "official" landing place." Coming to a conclusion of course is comforting to us all. On our way to Cape Bonavista we stopped off in Elliston to see puffins. The Atlantic Puffin turns out to be a smallish bird, about 32 cms or 13". For those of us who live in cities, a Puffin is about the same size as a [Rock] Pigeon; that bird often mounted on statues and the sides of buildings. We had been told that there was a good site to get up close to the bird, just off Maberly Road, in Elliston. A beautiful site reminiscent of the west coast of Ireland with rocky cliffs facing the sea. A trail guides one over a narrow causeway connecting two parts of the peninsula. At the end of the trail one faces the cliff wall of an island separated from the peninsula by about 100 - 200 meters. It is above the cliff of that distinct island that Puffins and some other birds were nesting. Yet, even with a 400mm lens it was hard to get a shot of the bird. Near St. John's is another Puffin site. In Bonavista we drove out to the end of the Cape, where a Lighthouse is located. Fog limited the view but may be this ambiguity was compatible with the historic significance of the location. We returned to our cottage in Trinity. We took diner at the Twine Loft Restaurant.